A man has been charged with burglarizing Icy Mae’s and Neill’s Home Store in Shell Knob last week after being identified on security tape footage. Heath Allan Sanborn, 32, was arrested on Thursday, April 23, for the crime that occurred around 10:26 p.m. on Wednesday night. According to an affidavit of probable cause written by Detective Robert Evenson, Sanborn broke into Icy Mae’s on Highway 39 by smashing the glass door and walking through. On the security footage, he was seen taking a collection jar for an animal shelter, and then he tried to open the cash register. When he was unable to open the register, he took the entire register with him. Employees of the restaurant, as well as Sheriff Mick Epperly and Deputy Angela Cole, identified Sanborn as the person in the video. When officers made contact with him, he was wearing the same jeans and shoes as on the video, as well as the same facial hair as on the video. According Evenson, Sanborn also had a deep cut on his left palm and his flashlight was found at a different burglary committed nearby with blood on it. Barry County Sheriff Mick Epperly confirmed that the other burglary was at Neill’s Home Store in Shell Knob where only change was stolen. The glass was smashed in at the back entrance at Neill’s, as well. Det. Evenson applied for a DNA warrant to match the blood at the crime scene to Sanborn, according to a statement released by the Sheriff’s Department. Sanborn was charged with burglary in the second degree, a class C felony, and theft/stealing,a class A misdemeanor. 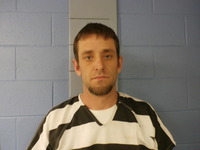 He is being held in the Barry County Jail in lieu of a $10,000 bond.